Clubhouse-Open to all members, guests and public. There will be several members with Coins, Currency and Bullion available for sale. some volunteers to help out. This is your reminder that our next coin club meeting is this coming Monday the 15th. The meeting will begin at 7:00 as usual. 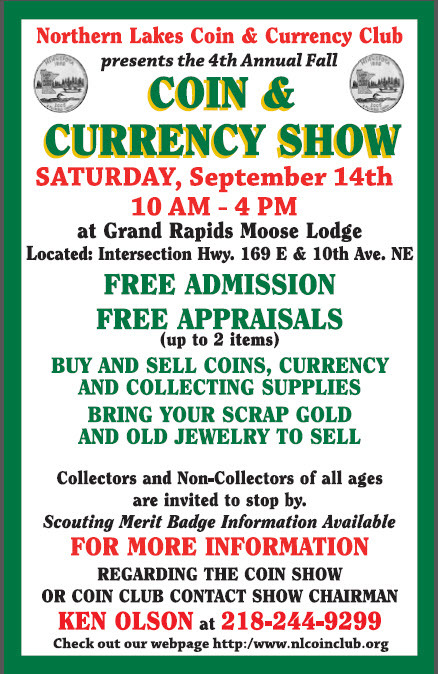 Attached you will find a copy of our Coin & Currency Show flyer. The show has been set for September 14th. I will bring orange flyers and black & white flyers for any of you to pick up at the meeting so that you can put them up in various places you visit. Feel free to forward the email flyer on to everyone you know. The more we get it out there, the better attendance we will have.